Dining out in Singapore does not have to leave a hole in your wallet. 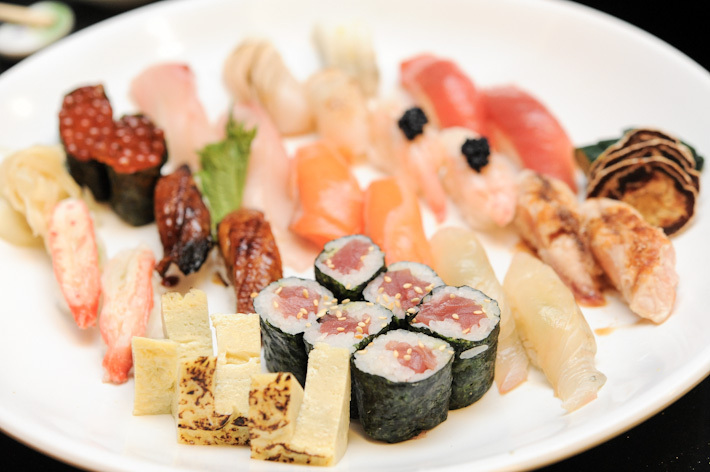 There are several sushi joints in town which serve good Japanese food at very reasonable prices. 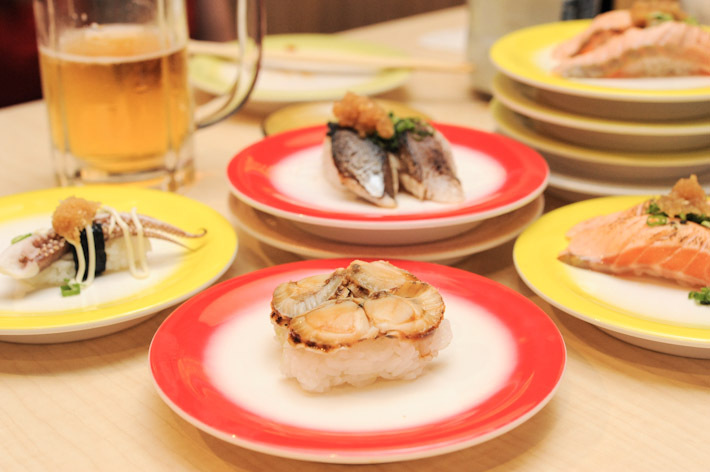 Here is a guide to affordable sushi restaurants in Singapore. 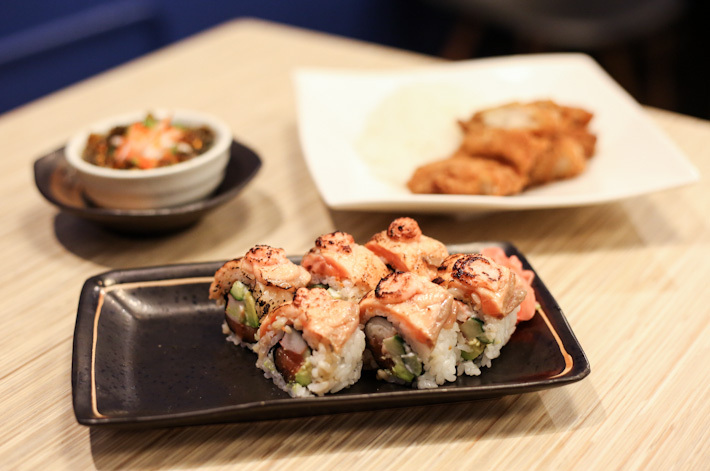 Koh Grill & Sushi Bar is a small eatery nestled a corner of Wisma’s Food Republic which serves delicious and inexpensive Japanese food. The star dish here is the legendary Shiok Maki. 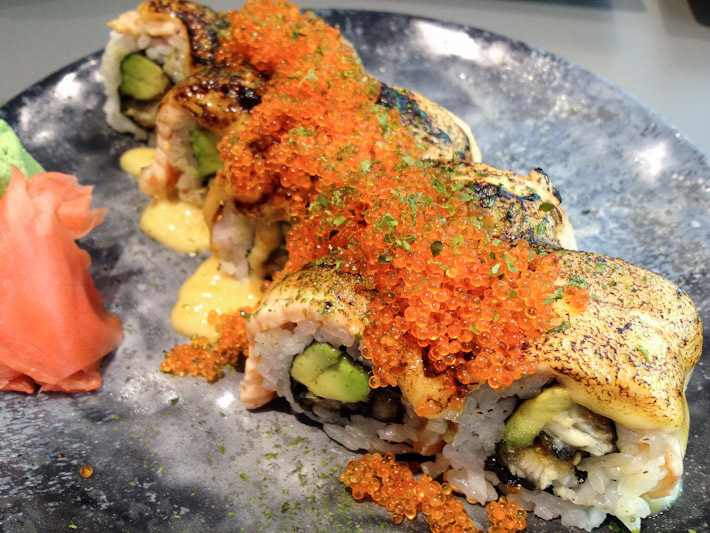 It is made up of avocado, unagi and aburi salmon, drenched with the most amazing cheesy sauce that is seemingly a legit mixture of mayo and mentai, and completed with a generous topping of tobiko. 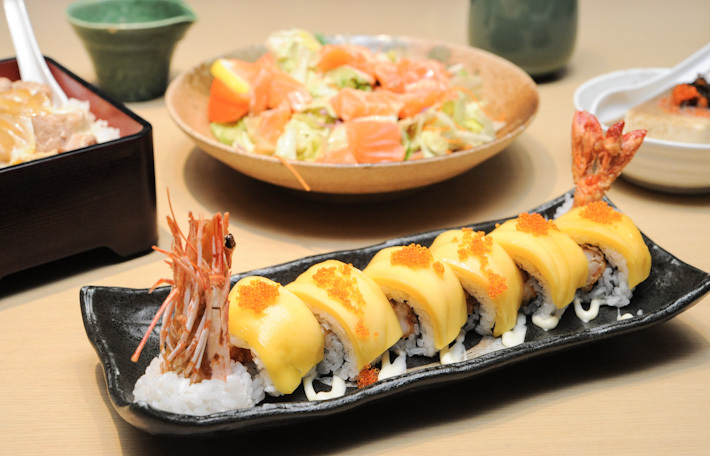 This is surely one place for a quick fix of Japanese food in between shopping at Orchard Road. 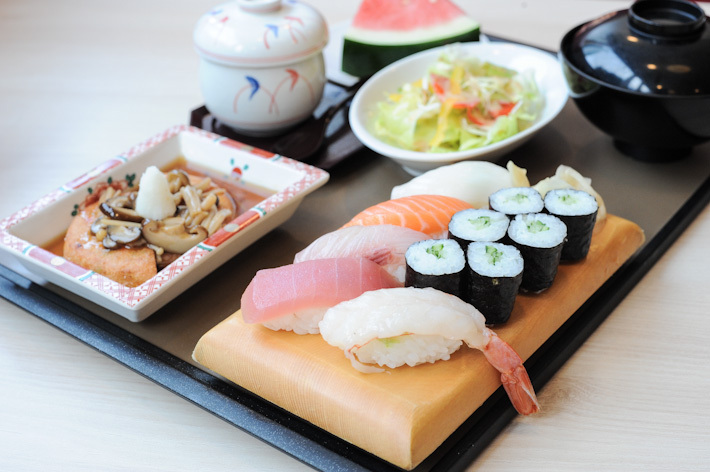 One of the most popular casual Japanese restaurants in Singapore, Sushi Tei is where locals head to for cheap and good Japanese food. There are many popular dishes, but we love the absolutely stunning Sashimi Salad, which comes with a generous serving of sashimi; and the Golden Roll. Tomi Sushi may not be the cheapest restaurant in this guide, but it offers a variety of set lunches which are great value for money. Let’s make this clear: Tomi Sushi is not one of those classy Japanese restaurants where you bring your partner on a date night; it is more like a neighbourhood joint where you know that the food is always good, and you are surrounded by families happily tucking in. Wasabi Tei used to command long queues during its heydays, but since its former Chef Peter left, business has slowed down significantly. While the food is not out-of-this-world good, there is no denying that it is very affordable – most of the bento sets are priced between S$6 to S$12. If you need a fuss-free meal when in Orchard Road, this is a place where you can have decent Japanese food without breaking the bank. And best of all, you no longer have to queue up to get a table here. For more recommendations, read our guide to Singapore’s Best Japanese Restaurants. What about ichiban sushi? It’s way cheaper than itacho sushi! @Susie Ichiban Boshi is not bad, but we prefer the places listed in this guide. And the picture is not wrong. For ladyironchef, the photo comes first before the words. The photo of the sushi bar is on the previous shot. Hope this explains! Well.. I think you should give sushi express a try. I went to check out Peter’s current restaurant today. Still serving very delicious and fulfilling sashimi in generous portions and and the price is still reasonable. For those who miss his food can go and visit him at mitsuba @ the central!